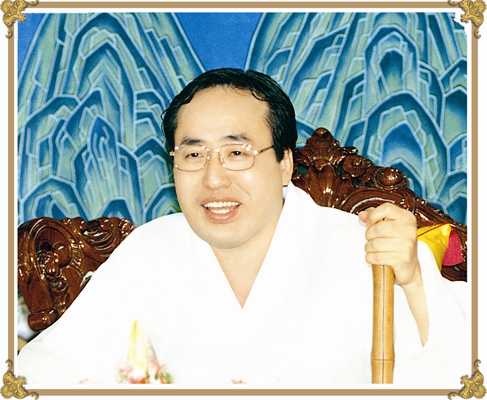 Born in 1954, Ahn Gyeong-jeon, His Holiness the Jongdosanim, grew up with the tradition of Sangjenim’s and Taemonim’s teachings, and he has completely devoted his life to spreading these teachings. In 1974, he and His Holiness the Jongdosanim co-founded the modern Jeung San Do movement. In 1977, at age twenty-four, he experienced spiritually the great cataclysm of gaebyeok and affirmed his resolve to spread Sangjenim and Taemonim’s truth throughout the world. In 1984, he established Jeung San Do University, a program to develop practitioners so that they would be able to spread the teachings. In 1998, he founded the Jeung San Do Research Institute, where scholars from various fields undertake research and write about Jeung San Do. The Jongdosanim’s mission of disseminating the teachings has led him to conduct numerous lecture tours throughout Korea, and he has also lectured in the United States, Canada, England, Australia, Japan, India, and Indonesia. Today, he heads the effort to globalize Jeung San Do by training teachers and sending them to other countries and by guiding translations of Sangjenim’s and Taemonim’s teachings. Over the years, the Jongdosanim has authored numerous Koreanlanguage books about Jeung San Do. He devoted thirty years of research to publishing an authoritative and comprehensive account of Sangjenim and Taemonim’s supreme dao, leading to the publication of the Dojeon in 1992 and its subsequent editions. His work of research is always ongoing, and he travels Korea gathering written and oral histories.